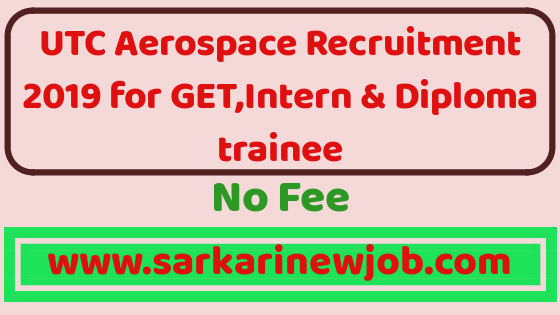 UTC Aerospace Recruitment 2019 | Graduate Engineer trainee & Diploma Trainee/INTERN| B.E/B.Tech/M.E/M.Tech/Diploma |No Fee - Sarkarinewjob.com A ultimate job portal to provide employment news. B.E/B.Tech (ME/MTech preferable) with good academic background. • Basic knowledge of GD&T and tolerance stack-up analysis. • Knowledge of materials and engineering concepts. • Expertise with design and analysis of Analog electronics, digital electronics, power circuits, sensor interfaces, FPGAs. • Experience in making presentations and communicating with management/customers. Strong technical writing and verbal communication skills. 3.Be responsible and accountable for the project deliveries in terms of quality and schedule? This position is for the Electronics & Motor Control Center (EMCC) at Global Engineering Centre, UTC Aerospace Systems. • Executes Value Engineering, New Product Introduction and Production support projects. • Software Validation as per requirements provided. • Conducts Unit tests/ Functional & System Test on the development environment or target systems. • Good programming skills in Embedded C, Ada, C++ and any Assembly language. * Good knowledge of Structure, Fluid dynamics, Fracture Mechanics, etc. * Good understanding of Materials and processes. * An understanding of manufacturing processes and construction methods. * He/She will be carrying out benchmarking exercise on different aspects of landing gear. Pursuing Post Graduate Engineering in Mechanical / Machine Design / Aerospace.